Cool Toy Review is adding the Sideshow Collectibles Buffy the Vampire Slayer line of 1/6 scale figures to the Photo Archive this week. Since we love hanging with the Scoobies, we're giving you a chance to get in on the action! In cooperation with Sideshow Collectibles, we will be holding a trivia contest that will run from Monday September 17, until Sunday September 23. We will update our Photo Archive several times each day with new Sideshow Collectibles Buffy the Vampire Slayer and Angel 1/6 scale figures. Each Photo Archive page will contain a trivia question. Simply answer the question correctly and you are entered for a chance to win Lorne - The Host (Lounge Outfit) 1/6 scale figures. NOTE - The Trivia Contest is now over. All entries are being checked and the winners will be announced on Monday September 24, 2007. 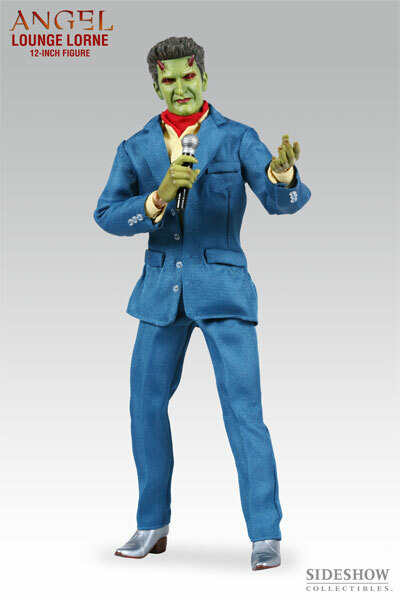 Lorne - The Host - What is the name of Lorne's karaoke bar? Cordelia - What is the name of the detective agency Cordelia works for? Buffy - What is the name of Buffy's hometown? Willow - What is the name of the club where the gang hangs out after a night of hunting vampires? Xander - Who is Xander's best friend? Giles - What was Giles' nickname when he was younger? Oz - What was the name of Oz's band? Faith - Who gave Faith's favorite knife to her? Liam - After Liam was transformed into Angelus, what was the first thing he did? Answer: He viciously & gleefully murder his own family. Buffy - Prophecy - Which character breathed life back into the Slayer when she was killed by the Master? 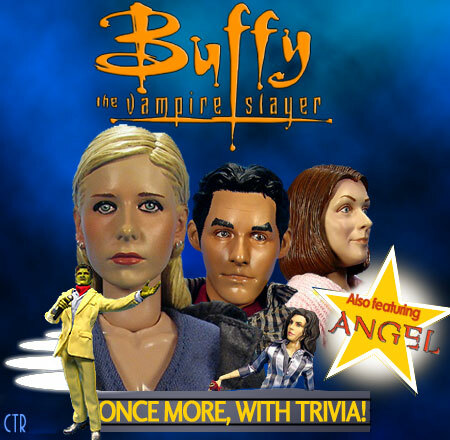 Buffy - Vampire - What is the name of Buffy's team of vampire hunters? Willow - Vampire - Who created he alternate reality that Cordelia wished for? Lorne - Lounge - What is Lorne's real name? The Master - When the Master first appeared, who were the two main vampires working for him? Spike (Subway) - What was the name of the vampire that sired Spike? D'hoffryn - When Anya leaves D'hoffryn's service, what does the demon do for retribution? Answer: He kills her fellow vengeance demon friend halfrek. The Gentlemen - Why can't you hear this trivia question? Answer: The Gentlemen absorb all sound...or in this case, text! All entries must be sent using the button on the Photo Archive page and must contain the correct answer as well as your full shipping address. For each question, only one entry will be permitted per household. Any additional entries will be disqualified from the draw. Winners will be selected at random from all the entries with that fit the above criteria. If the winning entry is not clamed within seven days, the new winner will be selected. **The winner must allow 4-6 weeks after announcement of win to receive the product. All prizes are non-transferable, with no cash redemptions and/or substitutions except at Sponsor's sole discretion. See below for more International Shipping Terms. To get the latest news from Sideshow Collectibles, join the Newsletter! At this time we are unable to make shipments to Venezuela or Nigeria.